This study is introduced at the beginning of class, and runs throughout the quarter. 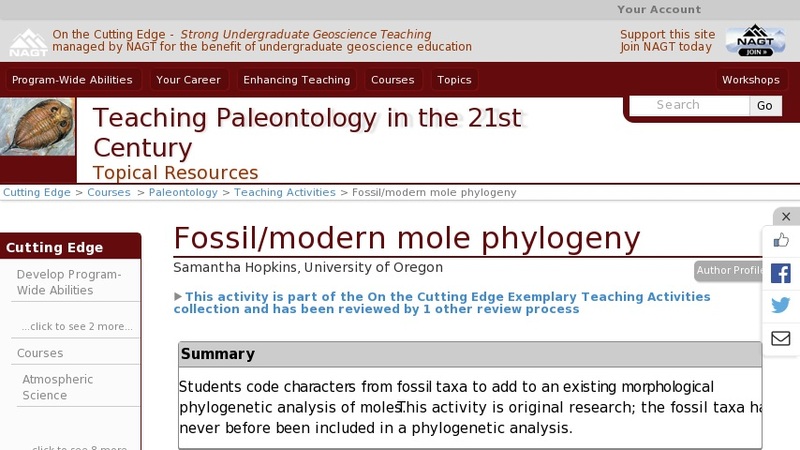 Students are first given a paper describing a morphological phylogeny of modern moles. The first few weeks' labs teach the students basic phylogenetic methods and the aspects of skeletal morphology needed to understand the character descriptions. Students in groups of 2 or 3 are assigned a set of characters from a particular region of the skeleton (i.e. humerus, lower teeth, skull, etc.). Those groups are responsible for learning to distinguish those characters on a representative group of modern specimens (for which the character codings are already available in the paper they have) and then coding those characters for a number of fossil taxa. The fossils are either described in papers posted on the course website or are represented by specimens held in the instructor's research lab. Students are responsible for finding time to come in and work with the specimens. The next to last lab of the quarter is concerned with analyzing data within each group, for the class as a whole, for fossil taxa alone, and for fossil and modern taxa. Students then write up the results of their analyses for their term project due at the end of the quarter.